::: Off the Radar :::: An Indie Christmas! Still can't believe it's almost Christmas and that the year is almost over! 2010 went by way too fast, but I am looking forward to 2011 and it's new adventures and endeavors. In the mood to spread some Indie Christmas cheer?! 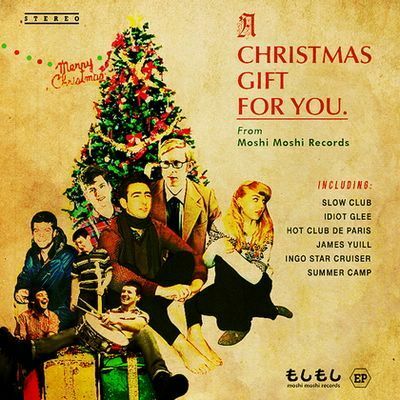 Well Moshi Moshi Records releases 6 sweet Christmas songs on the album, "A Christmas gift for you from Moshi Moshi" (available here) with some of their top new artists, Summer Camp, James Yuill (that I blogged about here in May), Hot Club de Paris, Slow Club, Ingo Star Cruiser, and Idiot Glee. I am thankful for many people in my life and the opportunities that have occurred this year. Contributing to this great music blog and working with a wonderful team is definitely one of them. The frosting on the sugar cookie is being able to share one of my greatest passions with all of you! On behalf of the team, thank you for your continued support, we greatly appreciate it! love the winter wonderland cover!